I'm using Mint 18.2-Cinnamon-64 bit with the stock 2.8 Gimp as installed (I haven't added the usual stuff to it, since this is a new install). After using it for a few days, it has become apparent that the Recently Used File List periodically becomes empty. I had experienced this issue before on Ubuntu 16.04 (but I don't recall running into it in earlier versions of Ubuntu or even on Windoze). Since that Ubuntu 16.04 install was more than a year old, I just assumed that I had installed something else along the way that caused the problem and I learned to live with it but, on a new install (totally new; new OS on a new drive, only stock apps, etc.) I have to assume it's something more fundamental - either to Gimp or something in Ubuntu that is inherited by Mint/Cinnamon. For instance, I last used Gimp with several files on Friday afternoon (it's now Saturday morning), and the list is empty. Yesterday afternoon when I loaded a file, the list had about ten items. So I checked ~/.local/share/recently-used.xbel: it had no Gimp listings in the file. Then I loaded Gimp, opened a file, saved it, and exited. Now, once again ~/.local/share/recently-used.xbel has an entry for the file I just opened. I reopened Gimp and the Recently Used File List contains just that one file name. Gimp seems to be able to write to and read from the xbel so I'm guessing something external is emptying it. I can't correlate the file list clearing with anything else I've been doing. Does anyone have any suggestions? (10-14-2017, 01:42 PM)foberle Wrote: ...snip...Gimp seems to be able to write to and read from the xbel so I'm guessing something external is emptying it. I can't correlate the file list clearing with anything else I've been doing. Does anyone have any suggestions? Basically do not know: I use Kubuntu 16.04 and I have ~/.local/share/recently-used.xbel disabled because I hate it. 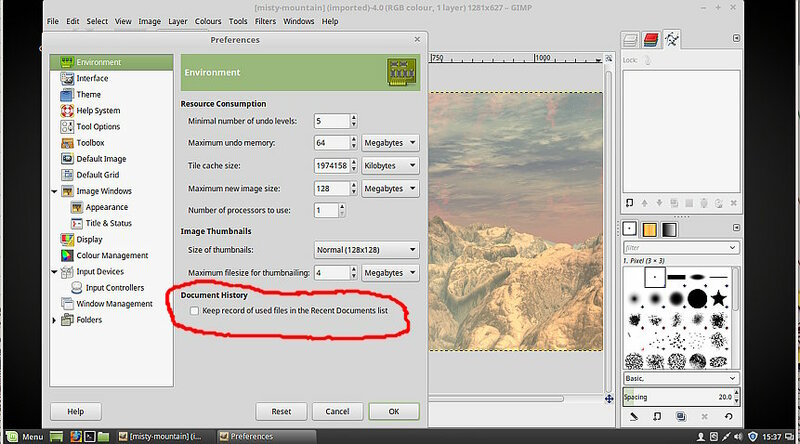 First thing to check is in Gimp: Edit -> Preferences -> Environment Bottom of that is a checkbox for Document History. Unchecked and recent files only lasts as long as the Gimp session. Other than that, if you use bleachbit. Even if started automatically AFAIK you will get the bleachbit dialogue to confirm clean-up. 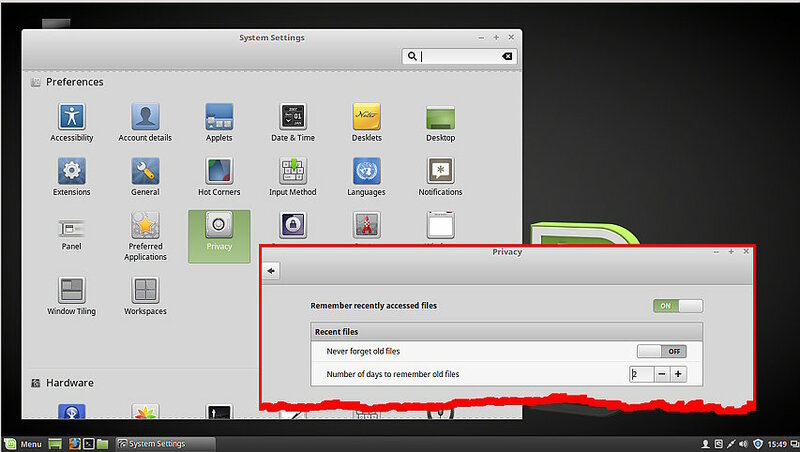 One of the settings is remove history. I did have the Environment set to save document history, but the System Settings -> Privacy had "Remember Files" turned OFF. I wasn't even aware that existed, although I'm a little miffed that the OS has a setting to quietly override an app setting. I've turned that on and set it to save for 60 days, which will let me see if that's the cause. I went to the corresponding setting in Ubuntu, but it seems quite different, which makes me wonder if there are two different problems. At my age, however, I'm easily confused, so we'll see. Thanks much for the quick reply. Just FYI: I've never used BleachBit, since it gets so many negative comments on line and I've never really needed it. (of course, if an application breaks it each time it tries to use it, it won't appear in that list). Fascinating; I ran the grep as you suggested on my Ubuntu machine and discovered something called file-roller that I didn't know existed. Apparently this is an alternative archive creation tool that comes installed by default or perhaps is installed along with another utility.